In the last progress update the replacement rear valence panel was fitted and glued into place. In this update work continues on the rear clip with a focus on finishing the installation of the rear valence panel. This effort will include cutting out the exhaust openings and bonding several reinforcing strips in place. This update will also include some information on reinstalling the rear splash shields. In order to continue progress on the rear valence panel I first removed the stock exhaust flange bonding strips from the original valence panel, cleaned them of the old bonding compound, and prepared them for installation on the new panel. These strips are bonded on either side of the exhaust opening and provide support for the body panels and exhaust bezels. Since the replacement rear quarter panel did not come with an opening for the exhaust pipe the next step was to create an appropriate opening (note: if you have side exhaust you wouldn’t cut out these openings). Using a straight edge and clamp the passenger side bonding strip was aligned, clamped in place, and drilled for temporary screws. However, soon after installing the temporary screws…. …it occurred to me that I really ought to take a measurement of the exhaust bezel and compare that to the opening I was about to create. Thankfully, my initial efforts did the trick and the exhaust bonding strip was positioned in the right spot. So, with the alignment of the bonding strip verified, I used a permanent black marker to trace an appropriate cut line. Next the bonding strip was removed and the excess fiberglass was cut away using a Dremel. While cutting I intentionally aired on the side of caution and left a little extra material in place. Although it’s easy to trim more material away later, adding material back in isn’t quite so simple. After the cutting was complete the bonding strip was temporarily screwed back in place and a die grinder was used to remove the excess material from along the edge of the bonding strip. Finally, before bonding the strip in place, I test fit the bezel in the opening. The bezel fit pretty well so a similar process was repeated on the drivers side. Prior to doing any bonding work there were a few other areas that needed to be checked. The first was to verify the fit-up of the rear valence panel was correct with respect to the rear quarter panel and tail lamp panel. My primary concern was to ensure all of the panel intersections were still flush without any obvious kink points. These areas were verified with a straight edge and, thankfully, the panels were in proper alignment. However, it should be noted that significant effort was made during installation of the panels to ensure the fit was correct. This step was simply a verification to ensure that nothing had shifted without my knowledge during the bonding process. With the fit of the panels and bonding strips verified I moved on to prepping the surfaces to receive the bonding strips. As was done in other spots, a die grinder with a 20 grit sanding disc was used to roughen all surfaces. These surfaces were then thoroughly cleaned with lacquer thinner prior to bonding. …and the flanges were screwed into place. With the rear valence panel now essentially finished, my focus was turned toward getting the rear splash shields installed. The first step was to dry fit each splash shield, position them correctly, and then trace along each edge to facilitate placement after the bonding adhesive is in place. In addition to the clamps several screws were also used to help hold the splash shields against the rear wall of the passenger compartment. But, before bonding the passenger side splash shield in place, a bit of finish work had to be completed along the underside of the rear deck. 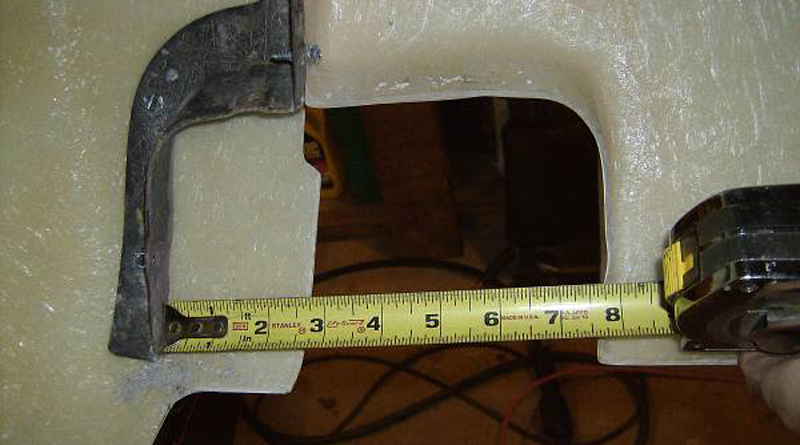 This is the area around the #4 body mount that needed significant fiberglass reconstruction work. Several updates ago the majority of this work was completed, but the connection to the rear deck was never finished. So, to finish off this effort, a structural and watertight connection needed to be made here. and then bonded them in place using ordinary bonding adhesive. Next, the splash shields were removed and the bonding surfaces were roughened using a die grinder and sanding disc. Note: When reattaching the splash shields it’s important to only bond the lower half of the splash shield to the quarter panel – the top half is not bonded. By placing adhesive only in the area roughened in the photo below, it ensures that warping and cracking of the rear quarter panel will not occur. Lastly, the splash shield was bonded to the lower portion of the quarter and the back wall of the passenger compartment. And there you have it! Major work on the rear clip is now essentially complete. All that remains is to clean up and fill the gaps between the body panels. That task will be tackled in the next update, followed by installation of the firewall and a new one piece front clip. Once the body work is complete I’ll probably be moving onto the interior of the car. For that task I’ve already started picking up some goodies (can you tell I’m getting tired of bodywork?). One such goodie is a pre-cut insulation kit. The kit contains enough foil-faced reflective insulation (similar to Reflectix) to insulate the full interior of a Corvette. This additional insulation should really help reduce the heat and road noise issues all C3’s seem to suffer from. Plus, the fact that the pieces are pre-cut will be a huge time saver! It would take hours to trace out and cut all these pieces! So, with that said, stay tuned for the next update! In the meantime, why not drop by the Corvette Restoration Forum for a little car talk? Also, don’t forget to “Like” this project on Facebook in order to receive the latest and greatest news regarding project updates and progress!